Dark matter almost certainly exists - otherwise, galaxy clusters wouldn't have sufficient gravity to hold themselves together. It was hoped dwarf galaxies could confirm the leading dark matter theories. But a new study has drawn a big, frustrating blank. Dwarf galaxies are considered ideal candidates to go dark matter hunting, because calculations suggest they're composed of up to 99% dark matter. The problem, of course, is that while we know there should be lots of dark matter there, we still don't really know exactly what dark matter is. In recent years, the most popular theory has been that super-heavy exotic particles are the key source of dark matter, and their relatively high subatomic mass means that they don't interact much with normal matter. This is known as the cold dark matter model, and it suggests that sets of these particles clump together gravitationally, forming the cores of galaxies. Over time, normal matter is attracted to the dark matter and, from that, an entire galaxy is born. That suggests — and plenty of simulations and theoretical models have backed this up — that dark matter should be clustered at the centers of galaxies. That's why a new study from the Harvard-Smithsonian Center for Astrophysics is such bad news. They examined the dark matter distributions of two dwarf galaxies and found that there was no higher concentration in the center of the galaxy than anywhere else. The dark matter was actually evenly distributed throughout the galaxy. The current cosmological model doesn't predict that, and it only adds to the challenge of figuring out just what is going on with dark matter. 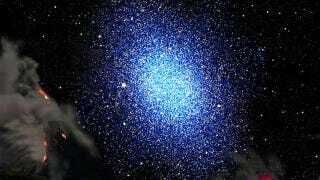 "After completing this study, we know less about dark matter than we did before. Our measurements contradict a basic prediction about the structure of cold dark matter in dwarf galaxies. Unless or until theorists can modify that prediction, cold dark matter is inconsistent with our observational data." "Stars in a dwarf galaxy swarm like bees in a beehive instead of moving in nice, circular orbits like a spiral galaxy. That makes it much more challenging to determine the distribution of dark matter. If a dwarf galaxy were a peach, the standard cosmological model says we should find a dark matter 'pit' at the center. Instead, the first two dwarf galaxies we studied are like pitless peaches." So where do we go from here? Well, it definitely doesn't invalidate the basic dark matter model - as much as this is a less than encouraging result, dark matter still stands up to scrutiny far better than any of the alternatives, such as Modified Newtonian Dynamics (MOND) - if you don't believe me, check out Dr. Dave Goldberg's fantastic primer on all things dark matter. This may well mean that we need to move away from the cold dark matter model to other explanations, although only cold dark matter really explains the formation of galaxies. This is all very much a mystery, and dark matter rather stubbornly refuses to reveal its secrets. The solution to all this is still anyone's guess, but hopefully further study can get us closer to, not further away from, what's actually going on. Via the Center for Astrophysics. Artist's conception of dwarf galaxy by David A. Aguilar (CfA).